ww2dbaseWilliam Lyon Mackenzie King was born in Berlin (now Kitchener), Ontario. Highly educated, he was elected to the parliament in 1908 and became the first Minister of Labor in 1909. After a defeat in 1911, he went to the United States to work for the Rockefeller family in the field of labor relations. In 1919, he became the leader of the Liberal Party and returned to the parliament soon after. In 1921, he became the Prime Minister of Canada, but resigned in 1925 as a result of a bribery scandal in his government. 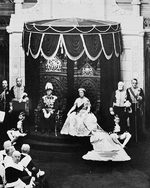 He returned to the seat of Prime Minister once again after the 1926 election. During his second term, he introduced socialist programs such as pensions for retirees and appointed Canada's first female senator, Cairine Wilson. He lost the seat once again after the defeat in the 1930 election, but returned to power once more in 1935. He supported Britain's appeasement policy toward Nazi Germany, and traveled to Germany to meet with met with Adolf Hitler and Hermann Göring. He believed, as revealed in his diary, that Hitler "might come to be thought of as one of the saviours of the world"; it was a sentiment that many British and Canadians believed at that time. His appeasement policies included the refusal to allow German Jews, fleeing Nazi policies, to enter his country. King realized war was inevitable in Aug 1939 and mobilized Canada for war. As a symbol to suggest Canada's independence from Britain, he delayed the Canadian entrance into the war until 10 Sep 1939, one week after the British. In 1940, his government introduced conscription for home service (until Nov 1944, only volunteers were sent overseas). During the war, King migrated Japanese Canadians to internment camps, but German Canadians received no such treatment; moreover, properties of Japanese Canadians were sold at public auctions during their exile, therefore many Japanese Canadians were unable to return to their homes after the war. This brought much criticism toward King. 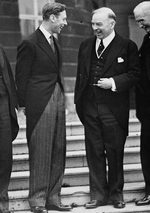 He hosted the Quadrant Conference in Aug 1943 and Octagon Conference in Sep 1944, both in Quebec, for Winston Churchill and Franklin Roosevelt to discuss the Allied strategic visions at the respective stages of the war. King retired in 1948 and passed away in his home near Ottawa in 1950. 17 Dec 1874 Mackenzie King was born. 11 May 1944 In an address delivered to both Houses of Parliament in the Palace of Westminster in London, England, United Kingdom, Mackenzie King, Prime Minister of Canada, stated that Canada's fight would be a fight to the finish and that the Canadian people would not relax until the monstrous conspiracy of the Fascist Powers to dominate and enslave the world had been eliminated. He further declared that once the war in Europe was ended, Canadian forces would join the other Allies for the final assault on Japan. 22 Jul 1950 Mackenzie King passed away. PM WLM King wanted nothing to do with the strategic direction of the war. He would have rather kept the Canadian soldiers that were stationed in Britain to remain there. While a great Prime Minister of Canada he was very hurtful to Canada's foreign relationship commitments. During the last 5 yrs of the war it was the Mackenzie King's own Cabinet War Committee that forced his hand to become more active in the war. He was a close supporter of GEN. A.G.L.McNaughton, very careful in his dealings with GEN. Harry Crerar. He had a huge falling out with his own Defence Minister forcing him to resign and asking GEN.McNaugton to replace him. PM King also favoured the Royal Canadian Navy to the Army or Air Force but was the first person to offer PM Churchill Canadian bases for the British Commonwealth Air Training Plan. i agree with the first comment, this should be more clear and there should be more information. I am also a grade 10 student, and i was hoping this would help me but it did not.